The last year has seen a lot of heated discussion and possible legislation regarding the Marine Aquarium trade. In these discussions everyone seems to have data on the numbers of fishes that move through the trade, but the sources of that data often somehow seems ‘iffy’. Today a new paper was published in the open access journal PLoS One (making scientific papers available to anyone for no cost!) 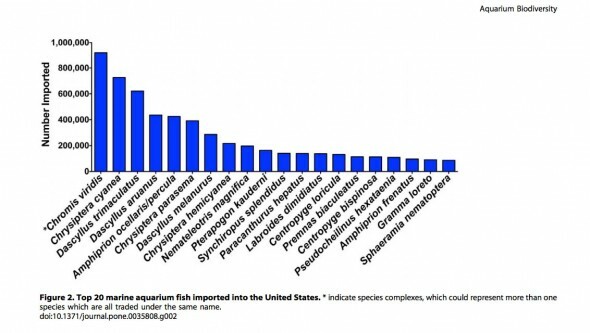 that examines a years worth of US marine fish import paperwork to present a clear picture of how many fish of what kinds are actually being imported into the country. The 9 page paper by Andrew Rhyne et al, available here, not only presents useful information, but also gives a great overview of the process of importing fish into the US as well as addressing some invasive species concerns. I expect in the coming weeks there will be a lot of themselves. Finally, actual data is available, and anyone that has ever entered into a discussion about the sustainability, ethics or responsibility of reefkeeping should take advantage of it.